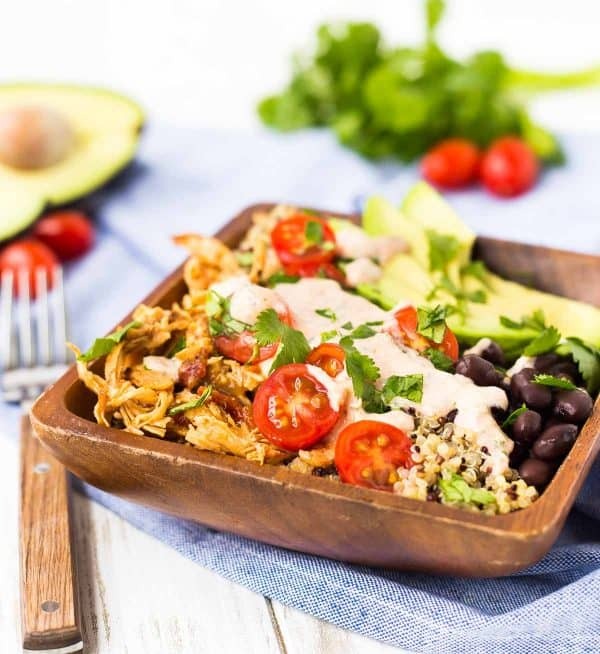 Chicken and black beans make this Southwestern Quinoa Bowl an incredibly filling and healthy lunch or dinner. It’s ideal if you do meal prepping! Meal prep, as we’ve talked about, is something I always try to do, but I’m not the best at. I find that if I try to do just a couple things, I’m always more successful. Enter this quinoa bowl. Prep the chicken and the quinoa and you’re good to go for the week. The rest of it takes minutes to prepare, especially after you’ve drained and rinsed the beans and put them in the fridge. 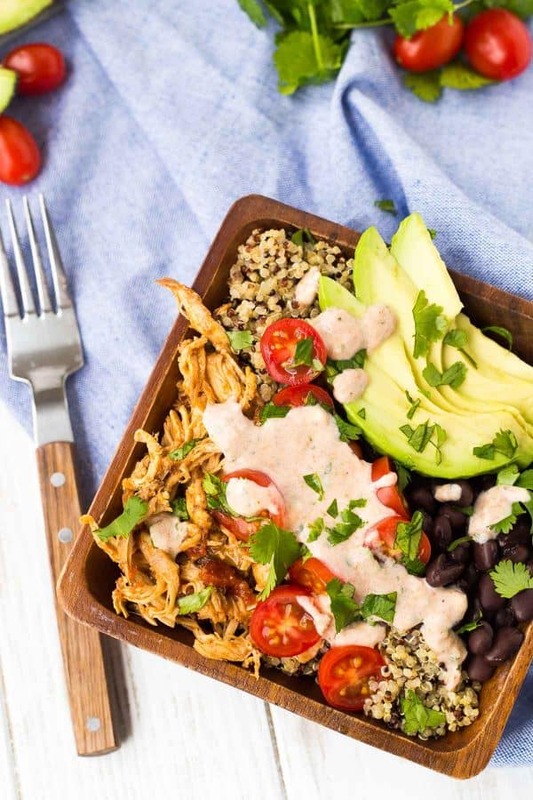 I use this slow cooker shredded chicken recipe – it’s one that I make SO often, especially if I find myself with a pack of chicken in the fridge that I thought I had plans for but life got in the way. Into the slow cooker with salsa and taco seasoning and life is good again. Sometimes if I don’t have a jar of salsa, I improvise with a can of tomatoes, a can of green chiles, and some finely diced onions in addition to the taco seasoning. I’ve also used my restaurant style salsa to make this chicken and it turns out wonderful (that’s what I used in the sauce too, but we’ll talk about that in a second). I also typically cook my quinoa in advance. I cook the entire bag at one time and then freeze it either in three cup or even 1 cup portions. It makes it so much easier to eat quinoa. Why cook it more than once if you don’t have to? If you want, you can read more about freezing quinoa…but be warned, that’s an ollllllld post….my style has changed a bit since then, to say the least. But what hasn’t changed is the method — still freezing quinoa over here in the Gurk household! The last thing I want to touch on is the sauce. It’s a simple combination of my restaurant style salsa (which I’m obsessed with) and Greek yogurt. You could also of course use sour cream here but I always have plain Greek yogurt in the fridge and hardly ever have sour cream. I drizzled this mixture on top of my southwestern quinoa bowl but you could also mix it with the quinoa if you feel the quinoa is a bit dry. If you want to make a little extra, you won’t be mad that you did and it’s quite low in calories so you don’t have to feel guilty about it. If you want to get even further ahead with meal prep, you could mix this dressing up in advance as well and have it ready to go. It may separate a bit in the fridge and get a watery layer on top, but just give it a stir and you’ll be good to go. 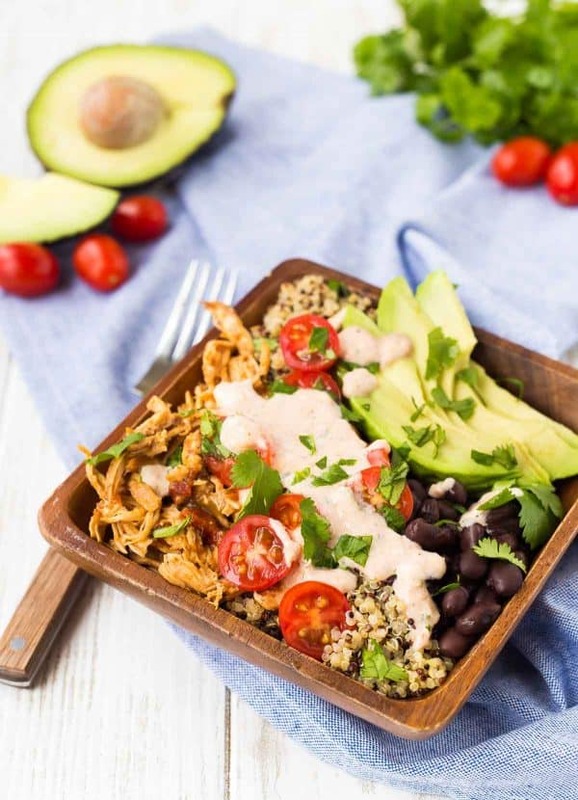 And of course, as with most of my recipes, have fun with this southwestern quinoa bowl! This one is especially forgiving. Throw some sauteed peppers and onions on there or whatever toppings you’d normally put on a taco. Mash the avocado up or use guacamole. Put so much cilantro on it that you can’t even see the other ingredients (or is that just something I do?). Make it your own! If you want to kick these up a notch, try topping them with my easy pickled red onions! 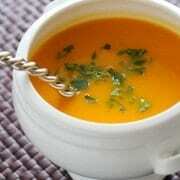 In a small bowl, mix Greek yogurt with salsa until combined. You can either save this to drizzle over the top or toss your quinoa in it. 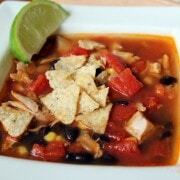 In a bowl, add quinoa, chicken, black beans, avocado, cilantro and diced tomatoes. Drizzle salsa and yogurt mixture over the top if you didn’t mix it with the quinoa. Notes: You may switch up this recipe depending on what you have on hand. Add lettuce, jalapeno, green onion, cheddar cheese, or use try it with a different protein. Note: I like this cold but you could also enjoy it warm. Heat the quinoa, chicken, and black beans in the microwave for 45 seconds to 1 minute or until warm and then add the remainder of the toppings. Husband’s take: He had no complaints! I tested this recipe on the same day I tested my other recent quinoa bowl recipe, and if he had to choose, I think this one gets his vote. 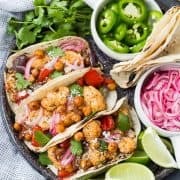 OF course, we’re talking about my husband the traditionalist and this recipe closer resembled some of his favorites, tacos and fajitas. Changes I would make: The sky’s the limit! 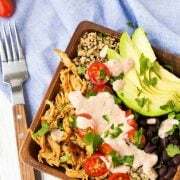 I don’t know about you, but I love burrito bowls and taco salads from certain fast-casual restaurants. This is similar, but so much healthier. You could put the whole thing on a bed of chopped romaine, or add some sauteed bell peppers and onions (they’d be a great substitute for the chicken, too, if you’d like to make this vegetarian). Try adding fun toppings — green onions, jalapeno, and cheese all come to mind. Don’t have chicken but have some leftover turkey or beef taco meat? Throw that on instead! Difficulty: With a little planning ahead, this recipe is so easy. Actual nutrition may vary depending on how recipe is prepared. Nutrition information includes toppings pictured. Oooh I’ve never thought about freezing quinoa before, but I kind of love that idea! I use quinoa a ton and this salad looks delicious!